In the realm of internet marketing, Google and Facebook are giants that dominate the landscape. Facebook and Google are the leading players in social media marketing and search engine optimization, respectively, and each site can do a lot to help a business succeed. There is great debate among marketers about which platform does the most for businesses. While a new report won’t end the debate, it does show that Facebook is more valuable for major publishers in driving referral traffic. Google is still the king of search, but when it comes to getting people to visit a site, links on Facebook have become more effective than Google when it comes to major publishers. 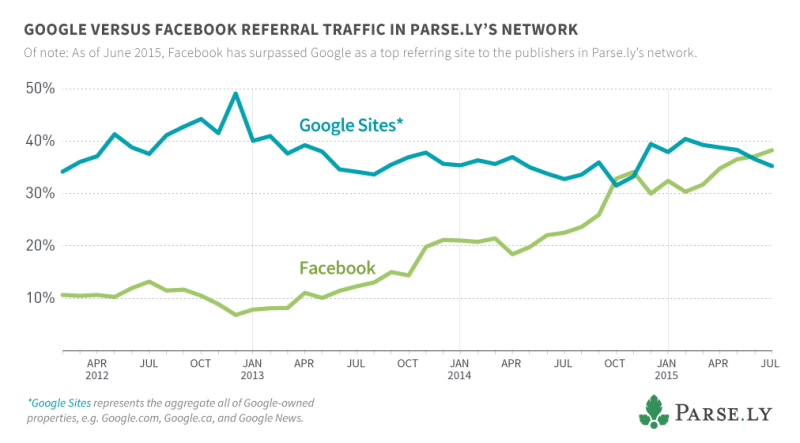 According to new data from Parse.ly, Facebook passed Google as the leading source of referral traffic in June and in July extended its lead to three percentage points, 38.2 percent to 35.2 percent. 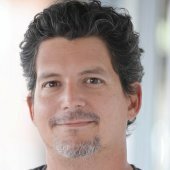 Parse.ly’s data comes from an analysis of the traffic sources of its more than 400 clients. This may not be an extremely large number of sites, but they include some of the largest publishers on the web. Some of the companies whose traffic was analyzed includes, Fox News, Telegraph Media Group, Mashable, Business Insider, Condé Nast, The Atlantic and Reuters. This means the data had thousands of articles and billions of clicks to analyze. Though Facebook only just past Google in June of this year, the event has been coming for a long time. Looking at the data provided by Parse.ly shows that Google began losing referral marketshare to Facebook back in January of 2013. Ever since, it’s been a relatively steady decline for Google as Facebook continued to grow. There are several explanations for this trend. The most important changes involve the way people use social media and changes Facebook has made to encourage referral traffic. When social media first arrived on the scene, people used it mostly for talking with other people or posting photos online. As the audience for social media grow, so did the kinds of things that were posted and shared. Now, Facebook has become as much as a source for news as it is for funny photos. Facebook has sought to encourage this trend by changing the way links are shown on the platform and including things like a Trending section to direct people to links that popular at the moment. This helps Facebook because getting people talk about news on the platform gives people another reason to visit the site. Finally, increases in the amount of money spent promoting content on Facebook is leading to more referral traffic. Most content publishers know that if they want to get a lot of people to see their content on social media, and then share it with friends for a multiplying effect, it’s necessary to use paid promotion to get the ball rolling. As people use Facebook’s paid promotion to increase the reach of content, so does the amount of referral traffic generated as a result. And though Google has one of the best PPC ad networks, it’s less useful for trying to promote topical news articles in a timely manner. Right now, Facebook and Google are roughly equal when it comes to referral traffic, with Facebook now holding a narrow advantage. Marketers should take this data as a sign that they need to include social media marketing in the overall marketing campaign. For more news about on Facebook, read this article on how Facebook and Twitter drive ROI for businesses.